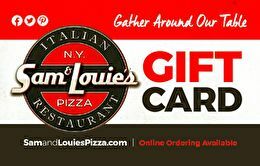 Sam & Louie's specializes in fresh, hand tossed pizza, pasta, burgers, chicken sandwiches, calzones, stromboli, salads and more. Our menus are sure to please every member of your family, your friends or your co-workers. Gluten free? We have a wide variety of delicious gluten free entrees for you to enjoy. Open 7 days a week for lunch and dinner. Enjoy happy hour every day from 3:00 - 6:00 p.m. or all day on Thursday. For balance inquiries call the phone number to a Sam & Louie's Pizzeria's location below.